The expanding frontier across Texas moved slowly west as new forts were built to protect settlers. This area was notorious for bandits, Indians, and rough terrain. The stagecoach was still a favorite for traveling west and delivering mail to the farther outposts and settlements of even more western states. The young nation called Texas was a huge area and people and their mail needed to cross the vast land. 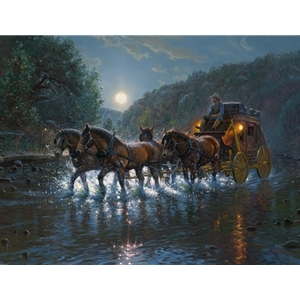 The History of the stage coach era is a glorious tale of rock houses built as "Stage Stops" and the handsome and durable hand made stage coaches that carried a new type of independent person. There were a lot of different stage companies, and I chose to paint one that operated out of Austin and traveled through the hill country region where they often traveled on river beds because of the flat limestone "pavement" they provided. At this moment, there is peace and calm as the light of the moon and the lanterns highlight the clomping splash of the horses hooves as they gently pull the stage through the Guadalupe River canyon on what we are calling the Texas Highway.